Some books are of legendary quality, classics reprinted again and again because of their ongoing relevancy and lasting strength. And then there’s the Marvel Legends series of collections. The banner up top comes with a weighty claim, yet most of these collections are long out of print and very hard to find. Are they legendary like the city of El Dorado, sought after for the adventure involved in the search, delighted in for their scarcity – but possibly long picked over and sadly disappointing? Or is there still gold to be found? This book, Wolverine Legends Vol. 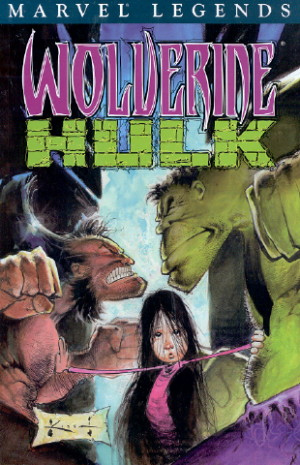 1: Wolverine / Hulk, certainly seems to glimmer upon first sight – it’s written and illustrated by Sam Kieth, undoubtedly a master and one of the most memorable artists from my own childhood. It stars two of Marvel’s heaviest hitters. 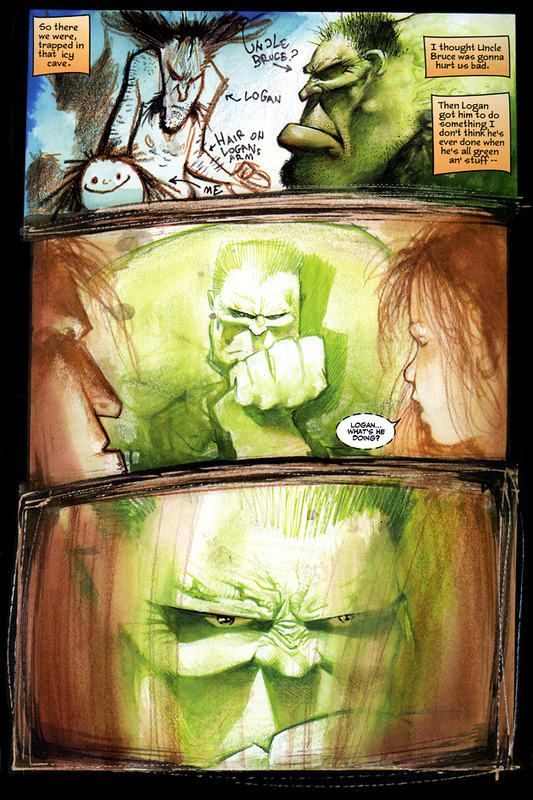 It’s worth noting at this point that the book should not be confused in any way with Hulk Legends Vol. 1: Hulk / Wolverine: Six Hours, which will no doubt show up in your ebay searches. Marvel Legends seem to hold to this formula: popular characters with well known and talented artists. My focus as a reviewer (and reader) is often on the story though and I’ll tell you right away that many of the Legends books are lacking in this area. They’re usually self contained and light on continuity, which can be nice, but they’re often out of character and/or downright confusing. And while it’s nice to see a line of greenish numbered spines on your shelf, reading these books straight through might leave a sour taste in your mouth. This is the first of the Wolverine Legends books and one of the harder ones to find. It’s not quite as bad as Snikt, which can go to a couple hundred in good condition for some reason. But it’s still selling for twice the cover on Amazon. Is it worth it? Yes, yes it is. The plot, which involves our two grumpy heroes trying to rescue a little girl, is full of overlong exposition and heavy handed foreshadowing. The dialogue can be a little clunky and obvious. But even though I could see the end coming from a mile away, the book still gets me every single time. Perhaps the art is just that good. 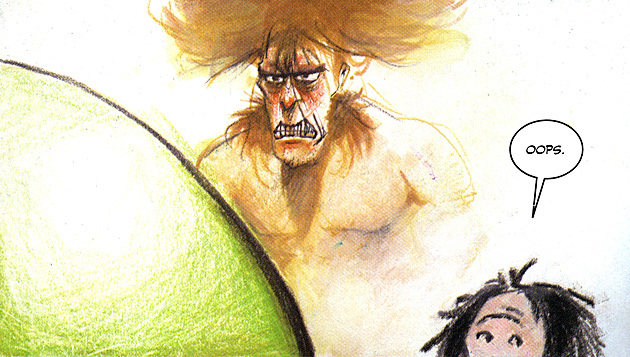 So while it may not be as subtle a psyche study as Ojo (which it’s thematically and visually similar to, at least in the design of the little girl) or any of Kieth’s other independent work, it’s still a good gateway into his world. Because it is a Marvel book, the superhero meet up formula is followed – there’s a fair amount of Logan vs. Hulk action here before they’ve gotten their act together. It’s not important. Kieth isn’t interested in exploring physical landscapes past the challenges they allow him to render for the occupants – obstacles acting as symbols of mental and emotional barriers. Deep pits, frozen wastelands, an angry mother polar bear, and even each other – they’re all stand ins for the actual struggle against the pain of loss that heroes with such long (and often dark) pasts have to deal with. And the numbness and loneliness associated with their violent lives. Likewise, Kieth’s art is shapely and crafted but never “realistic.” In fact, he often shifts to the childlike perspective of Po, with crayon-like lines and simplified faces. 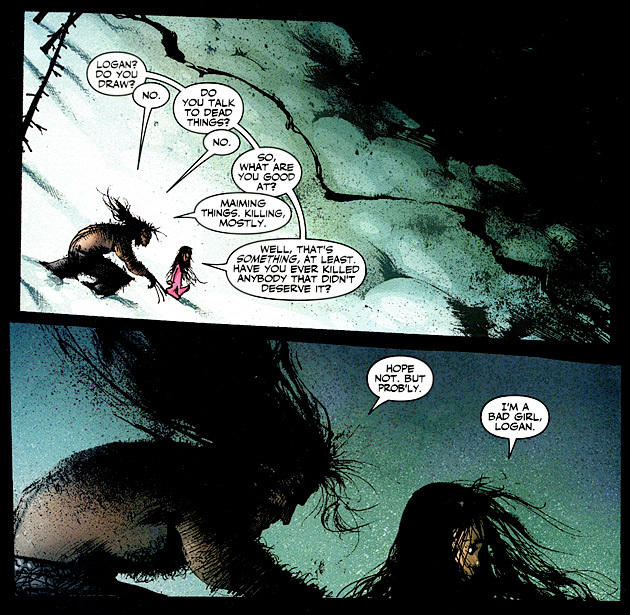 The dialogue is similar, sometimes from her perspective, sometimes from that of Logan or Banner, at times talking to themselves, each other, or directly at the reader. The heroes slip quickly from exaggerated caricatures to deeply moving renderings. 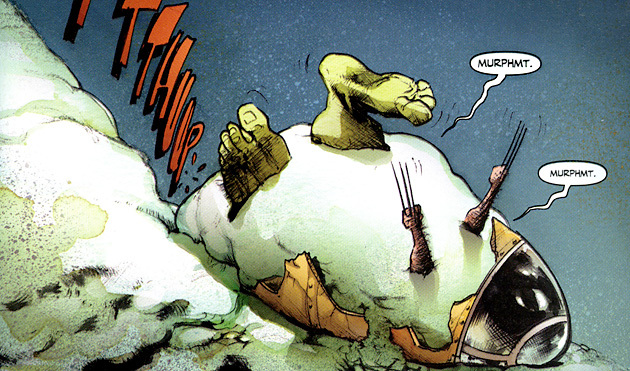 The necessary traits are still there, of course, with Wolverine bristling with wild hair and The Hulk’s shadowy bulk bursting out of the panels. It’s wildly creative art and while there were times where I felt like the story could have been told at a quicker pace, I was thankful for the opportunity to see more of Kieth’s drawings on each page. They never disappoint, in turns hilarious and heartbreaking, with a healthy amount of outrageous action. For this title, “Legend” is fitting. There’s no real indication that any of this “really happened” but it’s a powerful book. 4 out of 5 stars. If the plot flowed a bit smoother it would be a solid five, but it’s very much worth the price to see Kieth play with Logan and Banner for a hundred pages. This book doesn’t even make an attempt to fit into continuity at any time, but it does a good job of fleshing out the involved characters and doesn’t conflict anything I know of. You may enjoy this book if you are an existing fan of one or both of the characters (and Wolverine collectors are probably the most likely to have hunted this down) but I think the average pop culture knowledge of the two may be enough to let you jump in. It’s pretty self contained. The next book in the Wolverine Legends series is Vol. 2: Meltdown. But it’s totally unrelated and is a Havok crossover. Since I knew nothing about that character, it wasn’t my favorite book. Instead I’d recommend getting more into Kieth’s work, starting perhaps with the novel I mentioned above, Ojo. Beth has said she may review it for us soon. Another Keith series I liked a lot was Zero Girl, and his most well known work is The Maxx, which I’m lightly familiar with through the show that ran while I was growing up, but I haven’t had the pleasure of reading yet, unfortunately. Probably because it can be so darn expensive to find in trade. New print run, please! Someone needs to a do a blog post (and I bet Bully already has) about all the different Wolverine hairstyles. I mean, there’s only one style, but there are a thousand variations. Ironically, it was volume 2 here, Meltdown (which if memory serves was one of Marvel’s earliest prestige series), where I was first introduced to just how f’ed up his hair could be, Anyway, Sam Kieth, I think, is better when he reigns it in a tad, or the characters specifically call for outrageous (the latest Lobo mini comes to mind). I just am never overly thrilled to see his interpretation of iconics…I guess I don’t mind it too much for Hulk, because that character is all over the map, but Wolverine looks too…not the best at what he does. haha, it’s true. He seems to draw what he wants to draw, style guides be damned, but I obviously liked it here. I’ve seen so many different interpretations of that character, though, that I think it’s ok to let him play. Of course, my favorite is the Patch era logan. I’ve always preferred him in plainclothes to uniform. yeah, I’ve got all 6 of them. Not sure if I’ll get around to every one, but I’ve always had a soft spot for this book. Wolverine is one of the few Marvel characters for which I actually have a few books. They really run the gamut in quality, though. This one’s definitely the best of the Legends line, in my opinion. 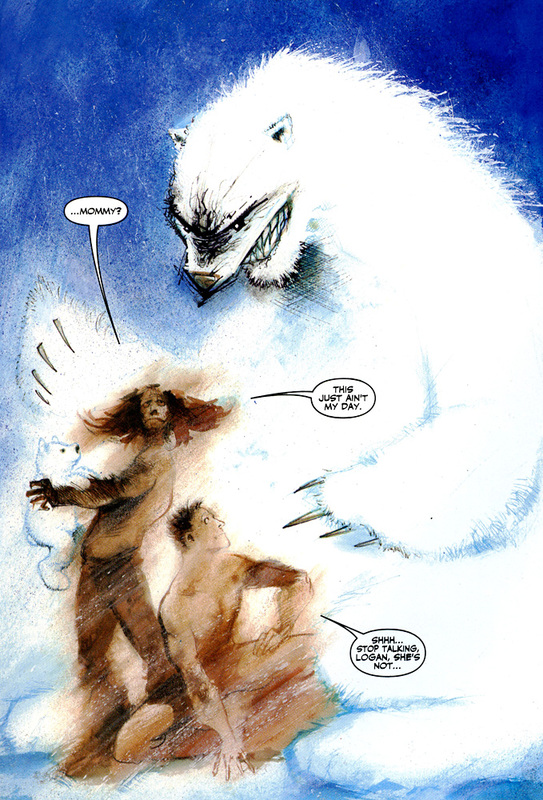 “Meltdown” is probably next because Jon J. Muth is a brilliant artist, although the story itself is a bit lacking. “Xisle” is okay (sort of like “Lost” meets Wolverine), and “Law of the Jungle” is a pretty disappointing end to Tieri’s run on the title. I’ve never read “Snikt,” or the Silvestri volume, though I’d suspect the latter might be decent. I remember enjoying Muth’s art, though I haven’t read that one in a while. I also remember the plotline being confusing, but probably because I had no idea who Havok was or what his power set entailed. Snikt was ok, I think. Honestly, none of them were particularly memorable past the setting except for this one. At least, this is the only one I’ve been driven to re-read recently. I’m very pleased to uncover this site. I want to to thank you for ones time for this particularly fantastic read!! I definitely liked every little bit of it and I have you book marked to look at new things on your website. My programmer iis trying to convince me to move too .net from PHP. to anothesr platform. I have heard very good things about blogengine.net. it? Any help would be geatly appreciated! like that before. So good tto discover another person with genuine thoughts oon this subject matter. sojeone wit a bit of originality!